"Long-distance track event" redirects here. For the speed skating events, see long track speed skating. Long-distance running, or endurance running, is a form of continuous running over distances of at least eight kilometres (5 miles). Physiologically, it is largely aerobic in nature and requires stamina as well as mental strength. Among mammals, humans are well adapted for running significant distances, and particularly so among primates. The endurance running hypothesis suggests that running endurance in the genus Homo arose because travelling over large areas improved scavenging opportunities and allowed persistence hunting. The capacity for endurance running is also found in migratory ungulates and a limited number of terrestrial carnivores, such as bears, dogs, wolves and hyenas. In modern human society, long-distance running has multiple purposes: people may engage in it for physical exercise, for recreation, as a means of travel, for economic reasons, or for cultural reasons. Long distance running can also be used as a means to improve cardiovascular health. Running improves aerobic fitness by increasing the activity of enzymes and hormones that stimulate the muscles and the heart to work more efficiently. Endurance running is often a component of physical military training and has been so historically. Professional running is most commonly found in the field of sports, although in pre-industrial times foot messengers would run to deliver information to distant locations. Long-distance running as a form of tradition or ceremony is known among the Hopi and Tarahumara people, among others. Distance running can also serve as a bonding exercise for family, friends, colleagues, and has even been associated with nation-building. The social element of distance running has been linked with improved performance. In the sport of athletics, long-distance events are defined as races covering three kilometres (1.86 miles) and above. The three most common types are track running, road running and cross country running, all of which are defined by their terrain – all-weather tracks, roads and natural terrain, respectively. Typical long-distance track races range from 3000 metres to 10,000 metres (6.2 miles), cross country races usually cover 5 to 12 km (3 to 7½ miles), while road races can be significantly longer, reaching 100 kilometres (60 miles) and beyond. In collegiate cross country races in the United States, men race 8000 or 10000 meters, depending on their division, whereas women race 6000 meters . The Summer Olympics features three long-distance running events: the 5000 metres, 10,000 metres and marathon (42.195 kilometres, or 26 miles and 385 yards). Since the late 1980s, Kenyans, Moroccans and Ethiopians have dominated in major international long-distance competitions. The high altitude of these countries has been proven to help these runners achieve more success. Mountain air, combined with endurance training, can lead to an increase in red blood cells, allowing more oxygen to be passed through the veins. The majority of these East African successful runners come from three mountain districts that run along the Great Rift Valley. Anthropological observations of modern hunter-gatherer communities have provided accounts for long distance running as a method for hunting among the San of the Kalahari, American Indians, and the Australian Aborigines. In this method, the hunter would run at a slow and steady pace between one hour and a few days, in an area where the animal has no place to hide. The animal, running in spurts, has to stop to pant in order to cool itself, but as the chase goes on it would not have enough time before it has to start running again, and after a while would collapse from exhaustion and heat. The body structure of a skeleton of a 12 years old Nariokatome boy is suggested to prove that early humans from 1.5 million years ago were eating more meat and less plants, and hunted by running down animals. With developments in agriculture and culture, long distance running took more and more purposes other than hunting: religious ceremonies, delivering messages for military and political purposes, and sport. 31 One post shall run to meet another, and one messenger to meet another, to shew the king of Babylon that his city is taken at one end, 32 And that the passages are stopped, and the reeds they have burned with fire, and the men of war are affrighted. Running messengers are reported from early Sumer, were named lasimu as military men as well as the king’s officials who disseminated documents throughout the kingdom by running. Ancient Greece was famous for its running messengers, who were named hemerodromoi, meaning “day runners”. One of the most famous running messengers is Pheidippides, who according to the legend ran from Marathon to Athens to announce the victory of the Greek over the Persians in the Battle of Marathon in 490 B.C. He collapsed and died as he delivered the message “we won”. While there are debates around the accuracy of this historical legend, whether Pheidippides actually ran from Marathon to Athens or between other cities, how far this was, and if he was the one to deliver the victory message, the marathon running event of 26.2 miles / 42.195 km is based on this legend. Bone and muscle structure: unlike quadruped mammals, which have their center of mass in front of the hind legs or limbs, in biped mammals including humans the center of mass lies right above the legs. This leads to different bone and muscular demands especially in the legs and pelvis. Dissipation of metabolic heat: humans’ ability to cool the body by sweating through the body surface provides many advantages over panting through the mouth or nose. These include a larger surface of evaporation and independence of the respiratory cycle. One distinction between upright walking and running is energy consumption during locomotion. While walking, humans use about half the energy needed to run. Evolutionary biologists believe that the human ability to run over long distances has helped meat-eating humans to compete with other carnivores. Persistence hunting is a method in which hunters use a combination of running, walking, and tracking to pursue prey to the point of exhaustion. While humans can sweat to reduce body heat, their quadrupedal prey would need to slow from a gallop in order to pant. The persistence hunt is still practised by hunter-gatherers in the central Kalahari Desert in Southern Africa, and David Attenborough's documentary The Life of Mammals (program 10, "Food For Thought") showed a bushman hunting a kudu antelope until it collapsed. Aerobic capacity depends on the transportation of large amounts of blood to and from the lungs to reach all tissues. This in turn is dependent on having a high cardiac output, sufficient levels of hemoglobin in blood, and an optimal vascular system to distribute of blood. A 20 fold increase of local blood flow within skeletal muscle is necessary for endurance athletes, like marathon runners, to meet their muscles' oxygen demands at maximal exercise that are up to 50 times greater than at rest. A long-distance runner's velocity at the lactate threshold is strongly correlated to their performance. Lactate threshold is the cross over point between predominantly aerobic energy usage and anaerobic energy usage and is considered a good indicator of the body's ability to efficiently process and transfer chemical energy into mechanical energy. :5–6 For most runners, the aerobic zone doesn't begin until around 120 heart beats per minute. Lactate threshold training involves tempo workouts that are meant to build strength and speed, rather than improve the cardiovasicutlar system's efficiency in absorbing and transporting oxygen. By running at your lactate threshold, your body will become more efficient at clearing lactic acid and reusing it to fuel your muscles. Uncertainty exists in regards to how lactate threshold effects endurance performance. The impact of long-distance running on human health is generally positive. Various organs and systems in the human body are improved: bone mineral density is increased, cholesterol is lowered. However, beyond a certain point, negative consequences might occur. Male runners who run more than 40 miles (64 kilometers) per week face reduced testosterone levels, although they are still in the normal range. Running a marathon lowers testosterone levels by 50% in men, and more than doubles cortisol levels for 24 hours. Low testosterone is thought to be a physiological adaptation to the sport, as excess muscle caused may be shed through lower testosterone, yielding a more efficient runner. Veteran, lifelong endurance athletes have been found to have more heart scarring than controls groups, but replication studies and larger studies should be done to firmly establish the link, which may or may not be causal. Some studies find that running more than 20 miles (32 kilometers) per week yields no lower risk for all-cause mortality than non-runners, however these studies are in conflict with large studies that show longer lifespans for any increase in exercise volume. The effectiveness of shoe inserts has been contested. Memory foam and similar shoe inserts may be comfortable, but they can make foot muscles weaker in the long term. Running shoes with special features, or lack thereof in the case of minimalist designs, do not prevent injury. Rather, comfortable shoes and standard running styles are safer. Many sporting activities feature significant levels of running under prolonged periods of play, especially during ball sports like association football and rugby league. However, continuous endurance running is exclusively found in racing sports. Most of these are individual sports, although team and relay forms also exist. The most prominent long-distance running sports are grouped within the sport of athletics, where running competitions are held on strictly defined courses and the fastest runner to complete the distance wins. The foremost types are long-distance track running, road running and cross-country running. Both track and road races are usually timed, while cross country races are not always timed and typically only the placing is of importance. Other less popular variants such as fell running, trail running, mountain running and tower running combine the challenge of distance with a significant incline or change of elevation as part of the course. Multisport races frequently include endurance running. Triathlon, as defined by the International Triathlon Union, may feature running sections ranging from five kilometres (3.1 mi) to the marathon distance (42.195 kilometres, or 26 miles and 385 yards), depending on the race type. The related sport of duathlon is a combination of cycling and distance running. Previous versions of the modern pentathlon incorporated a three or four kilometre (1.9–2.5 mi) run, but changes to the official rules in 2008 meant the running sections are now divided into three separate legs of one kilometre each (0.6 mi). Depending on the rules and terrain, navigation sports such as foot orienteering and rogaining may contain periods of endurance running within the competition. Variants of adventure racing may also combine navigational skills and endurance running in this manner. The history of long-distance track running events is tied into the track and field stadia where they are held. Oval circuits allow athletes to cover long distances in a confined area. Early tracks were usually on flattened earth or were simply marked areas of grass. The style of running tracks became refined during the 20th century: the oval running tracks were standardised to 400 metres in distance and cinder tracks were replaced by synthetic all-weather running track of asphalt and rubber from the mid-1960s onwards. It was not until the 1912 Stockholm Olympics that the standard long-distance track events of 5000 metres and 10,000 metres were introduced. The 5000 metres is a premier event that requires tactics and superior aerobic conditioning. Training for such an event may consist of a total of 60–200 kilometers (40–120 miles) a week, although training regimens vary greatly. The 5000 is often a popular entry-level race for beginning runners. The 10,000 metres is the longest standard track event. Most of those running such races also compete in road races and cross country running events. The one hour run is an endurance race that is rarely contested, except in pursuit of world records. The 20,000 metres is also rarely contested, most world records in the 20,000 metres have been set while in a one-hour run race. Women runners on a closed-off-road at the 2009 Yokohama Marathon. Long-distance road running competitions are mainly conducted on courses of paved or tarmac roads, although major events often finish on the track of a main stadium. In addition to being a common recreational sport, the elite level of the sport – particularly marathon races – are one of the most popular aspects of athletics. Road racing events can be of virtually any distance, but the most common and well known are the marathon, half marathon and 10 km run. The sport of road running finds its roots in the activities of footmen: male servants who ran alongside the carriages of aristocrats around the 18th century, and who also ran errands over distances for their masters. Foot racing competitions evolved from wagers between aristocrats, who pitted their footman against that of another aristocrat in order to determine a winner. The sport became professionalised as footmen were hired specifically on their athletic ability and began to devote their lives to training for the gambling events. The amateur sports movement in the late 19th century marginalised competitions based on the professional, gambling model. 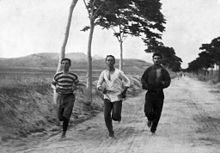 The 1896 Summer Olympics saw the birth of the modern marathon and the event led to the growth of road running competitions through annual public events such as the Boston Marathon (first held in 1897) and the Lake Biwa Marathon and Fukuoka Marathons, which were established in the 1940s. The 1970s running boom in the United States made road running a common pastime and also increased its popularity at the elite level. Cross country running is the most naturalistic form of long-distance running in athletics as competitions take place on open-air courses over surfaces such as grass, woodland trails, earth or mountains. In contrast to the relatively flat courses in track and road races, cross country usually incorporates obstacles such as muddy sections, logs and mounds of earth. As a result of these factors, weather can play an integral role in the racing conditions. Cross country is both an individual and team sport, as runners are judged on an individual basis and a points scoring method is used for teams. Competitions are typically races of 4 km (2.5 mi) or more which are usually held in autumn and winter. Cross country's most successful athletes often compete in long-distance track and road events as well. The history of the sport is linked with the game of paper chase, or hare and hounds, where a group of runners would cover long distances to chase a leading runner, who left a trail of paper to follow. The Crick Run in England in 1838 was the first recorded instance of an organised cross country competition. The sport gained popularity in British, then American schools in the 19th century and culminated in the creation of the first International Cross Country Championships in 1903. The annual IAAF World Cross Country Championships was inaugurated in 1973 and this remains the highest level of competition for the sport. A number of continental cross country competitions are held, with championships taking place in Africa, Asia, Europe, Oceania, North America and South America. The sport has retained its status at the scholastic level, particularly in the United Kingdom and United States. At the professional level, the foremost competitions come under the banner of the IAAF Cross Country Permit Meetings. While cross country competitions are no longer held at the Olympics, having featured in the athletics programme from 1912–1924, it has been present as one of the events within the modern pentathlon competition since the 1912 Summer Olympics. Fell running, trail running and mountain running can all be considered variations on traditional cross country which incorporate significant uphill and/or downhill sections as an additional challenge to the course. A number of events, records and achievements exist for long distance running, outside the context of track and field sports events. These include multiday races, ultramarathons, and long distance races in extreme conditions or measuring hundreds or thousands of miles. Beyond these, records and stand-alone achievements, rather than regular events, exist for individuals who have achieved running goals of a unique nature, such as running across or around continents (see lists of runners: America, Australia) or running around the world. ^ Grine, Frederick E. et al (October 2006). The First Humans - Origin and Early Evolution of the Genus Homo Archived 1 November 2013 at the Wayback Machine. Stonybrook University. Retrieved on 2013-04-11. ^ Stipp, David (4 June 2012). "All Men Can't Jump". Slate. ^ Parker-pope, Tara (26 October 2009). "The Human Body Is Built for Distance". The New York Times. ^ Herreman, Kari (12 September 2013). "What Are the Health Benefits of Running Half Marathons?". runnersgoal.com. Retrieved 1 March 2017. ^ Weil MEd, CDE, Richard (14 May 2015). "Running: Health and Disease Prevention - What are the Fitness Benefits of Running?". medicinenet com. Retrieved 1 March 2017. ^ Running in Hopi History and Culture. Hopi Cultural Preservation Office/Northern Arizona University. Retrieved on 2013-04-11. ^ Lonergan, J. E. The ecology of servitude in Tarahumara ritual tesgüinada. International Society for Gesture Studies. Retrieved on 2013-04-11. ^ How To Not Leave Your Family Out Of Your Running Life . Women's Running (9 March 2016). Retrieved on 2017-02-19. ^ How a 217.1 kilometre run became a national bonding ritual in Japan. New Statesman (18 January 2016). Retrieved on 2017-02-19. ^ Social Bonds and Exercise: Evidence for a Reciprocal Relationship. PlosOne (28 August 2016). Retrieved on 2017-02-19. ^ Roth, Stephen (2011). Exercise Genomics. p. 186. ^ "Why Are Kenya And Ethiopia So Good At Long-Distance Running?". Mpora. Retrieved 22 May 2018. ^ Bjerre, Jens. Kalahari. Hill and Wang, 1960. ^ Bennett, Wendell Clark, and Robert Mowry Zingg. "The Tarahumara, an Indian tribe of northern Mexico." (1935). ^ a b Sears, Edward Seldon. Running through the Ages. McFarland, 2001. ^ Walker, A. and Leakey, R. (1993). Nariokotome Homo Erectus Skeleton. ^ a b c Carrier, D. R., Kapoor, A. K., Kimura, T., Nickels, M. K., Satwanti, Scott, E. C., So, J. K., & Trinkaus, E. (1984). The energetic paradox of human running and hominid evolution. Current Anthropology, Vol. 25, No. 4 (Aug. - Oct. 1984), pp. 483-495. ^ Deane Anderson Lamont, Running Phenomena in Ancient Sumer" Journal of Sport History, Vol.22, No. 3 (Fall 1995). ^ History of the 24hr race, by Andy Milroy. Retrieved on 13 Aug 2013 from http://www.ultralegends.com/history-of-the-24hr-race/ Archived 7 March 2014 at the Wayback Machine. ^ Hammond, N. G. L. (1968). "The Campaign and the Battle of Marathon". The Journal of Hellenic Studies. 88: 13–57. doi:10.2307/628670. JSTOR 628670. ^ The" Hemerodromoi": Ultra Long-Distance Running in Antiquity . The Classical World, Vol. 68, No. 3 (Nov. 1974), pp. 161-169. ^ a b Lovejoy, C. O. (1988). Evolution of human walking. Scientific American (0036-8733), 259 (5), p. 82. ^ Margaria, R.; Cerretelli, P.; Aghemo, P.; Sassi, G. (1963). "Energy cost of running". Journal of Applied Physiology. 18 (2): 367–370. doi:10.1152/jappl.1963.18.2.367. ^ Lieberman, D. E.; Bramble, D. M. (2007). "The evolution of marathon running: Capabilities in humans". Sports Medicine. 37 (4–5): 288–290. doi:10.2165/00007256-200737040-00004. PMID 17465590. ^ a b c d e f g h i j k Zinner, Christoph; Sperlich, Billy, eds. (2016). Marathon Running: Physiology, Psychology, Nutrition and Training Aspects. Springer. ISBN 9783319297286. ^ a b Sarelius, I; Pohl, U (August 2010). "Control of muscle blood flow during exercise: local factors and integrative mechanisms". Acta Physiologica. 199 (4): 349–65. doi:10.1111/j.1748-1716.2010.02129.x. PMC 3157959. PMID 20353492. ^ Mairbäurl, Heimo (12 November 2013). "Red blood cells in sports: effects of exercise and training on oxygen supply by red blood cells". Frontiers in Physiology. 4: 332. doi:10.3389/fphys.2013.00332. PMC 3824146. PMID 24273518. ^ "Lactate Threshold: What It Is And How Do You Leverage It In Training? | Competitor.com". Competitor.com. 17 March 2014. Retrieved 22 May 2018. ^ "Benefits of Lactate Threshold Training for Distance Runners". Minneapolis Running. 23 March 2015. Retrieved 22 May 2018. ^ Faude, Oliver; Kindermann, Wilfried; Meyer, Tim (2009). "Lactate threshold concepts: how valid are they?". Sports Medicine (Auckland, N.Z.). 39 (6): 469–490. doi:10.2165/00007256-200939060-00003. ISSN 0112-1642. PMID 19453206. ^ Hagihara, Yoshinobu; Nakajima, Arata; Fukuda, Satoshi; Goto, Sumio; Iida, Haruzo; Yamazaki, Masashi (October 2009). "Running exercise for short duration increases bone mineral density of loaded long bones in young growing rats". The Tohoku Journal of Experimental Medicine. 219 (2): 139–143. doi:10.1620/tjem.219.139. ISSN 1349-3329. PMID 19776531. ^ Gordon, Benjamin; Chen, Stephen; Durstine, J. Larry (July 2014). "The effects of exercise training on the traditional lipid profile and beyond". Current Sports Medicine Reports. 13 (4): 253–259. doi:10.1249/JSR.0000000000000073. ISSN 1537-8918. PMID 25014391. ^ MacKelvie, K; Taunton, J; McKay, H; Khan, K (August 2000). "Bone mineral density and serum testosterone in chronically trained, high mileage 40–55 year old male runners". British Journal of Sports Medicine. 34 (4): 273–278. doi:10.1136/bjsm.34.4.273. ISSN 0306-3674. PMC 1724199. PMID 10953900. ^ França, Sheyla Carla A.; Neto, Barros; Leite, Turíbio; Agresta, Marisa Cury; Lotufo, Renato Fraga M.; Kater, Claudio E. (December 2006). "Divergent responses of serum testosterone and cortisol in athlete men after a marathon race". Arquivos Brasileiros de Endocrinologia & Metabologia. 50 (6): 1082–1087. doi:10.1590/S0004-27302006000600015. ISSN 0004-2730. ^ Wilson, Mathew G.; O'Hanlon, Rory; Prasad, Sanjay; Deighan, Amanda; MacMillan, Philip; Oxborough, David; Godfrey, Richard J.; Smith, Gill; Maceira, Alicia (17 February 2011). "Diverse patterns of myocardial fibrosis in lifelong, veteran endurance athletes". Journal of Applied Physiology. 110 (6): 1622–6. doi:10.1152/japplphysiol.01280.2010. ISSN 8750-7587. PMC 3119133. PMID 21330616. ^ Design, ISITE. "OASIS". www.abstractsonline.com. Retrieved 14 June 2017. ^ Wen, Chi Pang; Wai, Jackson Pui Man; Tsai, Min Kuang; Yang, Yi Chen; Cheng, Ting Yuan David; Lee, Meng-Chih; Chan, Hui Ting; Tsao, Chwen Keng; Tsai, Shan Pou (1 October 2011). "Minimum amount of physical activity for reduced mortality and extended life expectancy: a prospective cohort study". Lancet. 378 (9798): 1244–1253. doi:10.1016/S0140-6736(11)60749-6. ISSN 1474-547X. PMID 21846575. ^ Richard A. Lovett (9 June 2014). "A Guide to Running Shoe Inserts". Runner's World. Retrieved 14 April 2018. ^ Arnold, John. "Expensive running shoes don't prevent injuries, but comfortable ones might". The Conversation. Retrieved 14 April 2018. ^ Craig Payne (28 January 2017). "RCT of traditional running shoes vs minimalist running shoes". The American Journal of Sports Medicine. 45 (5): 1162–1170. doi:10.1177/0363546516682497. PMID 28129518. Retrieved 14 April 2018. ^ "The evidence-based solution for choosing running shoes". evidencebasedliving.human.cornell.edu. Retrieved 14 April 2018. ^ Competition Rules 2012-13. IAAF. Retrieved on 2013-04-13. ^ 60-Second Guide: Fell Running. Runner's World (25 March 2008). Retrieved on 2013-04-13. ^ Goodhart, Benjie (3 June 2008). The only way is up. The Guardian. Retrieved on 2013-04-13. ^ Getting Started in Triathlon. 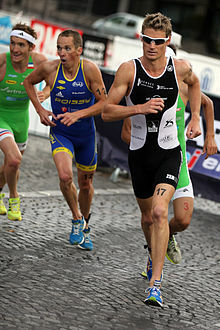 International Triathlon Union (28 December 2012). Retrieved on 2013-04-13. ^ About Duathlon Archived 13 February 2013 at the Wayback Machine. USA Triathlon. Retrieved on 2013-04-13. ^ Branch, John (26 November 2008). Modern Pentathlon Gets a Little Less Penta. New York Times. Retrieved on 2013-04-13. ^ Cummings, Jesslyn (29 June 2007). Orienteering for Runners - an Overview. About.com. Retrieved on 2013-04-13. ^ Adventure Racing Basics Archived 3 September 2012 at the Wayback Machine. Adventure Sports Online. Retrieved on 2013-04-13. ^ Road running – Introduction Archived 23 October 2012 at the Wayback Machine. IAAF. Retrieved on 2010-05-27. ^ Belson, Ken (2 November 2012). "Tokyo Will Be Added as Sixth Major Marathon". The New York Times. Retrieved 1 March 2017 – via NYTimes.com. ^ Cross country – Introduction Archived 27 February 2011 at the Wayback Machine. IAAF. Retrieved on 2010-05-27. This page was last edited on 7 April 2019, at 16:17 (UTC).